Stationery is no small investment. That’s why we offer a free consultation and provide you with a proposal that’s tailored to you and your wedding. Our Semi-Custom Process eliminates overwhelm and uncertainty by providing you with a stationery expert to walk you through all your stationery details from start to finish. Browse our available designs here and select a collection design that fits your wedding aesthetic. Our designs can be customized with paper choices, ink colors, envelope options, and even custom artwork, depending on the suite. Request a quote by completing our Semi-Custom Questionnaire. We will gather some of the big details such as your wedding date, estimated guest count, and estimated budget for invitations. After we receive your questionnaire, we will reach out to set a time for your free consultation. We believe that before you hand over your hard-earned money, you should talk to a real person. We know you will have questions and we are here to walk you through the process. We will help you make the most of your budget and ensure the highest quality of paper goods for your wedding. After our consultation, we will send custom proposals and contracts for you to sign. Rather than paying one lump sum, as on ready-to-purchase sites, we break your quote into three payments. We can also include additional stationery such as Save the Dates, Menus, Place Cards, Table Numbers, etc. Then we will add your project to our production calendar. We are a small studio and only take on a limited number of clients at a time. It is best to inquire early to be sure we can accommodate your ideal mailing date for your wedding. This is the most economical option. Digital printing creates a smooth finish as the ink is deposited on the surface of the paper. The number of colors printed is unlimited, which makes it the perfect choice for watercolor artwork. Letterpress is created the old fashioned way with plates that are inked and then pressed into the paper. This creates a beautiful textural impression and feels luxurious to the touch. Ink colors are matte and soft. Foil printing is created the same way as letterpress, but rather than ink, a metallic foil sheet is used. This creates some impression on the paper and a beautiful metallic finish to the design. It feels luxurious and creates a beautiful visual. Our house paper is imported from Italy and extremely versatile. It is one of the only papers that works with all three printing methods we offer. It features delicate deckled edges (uneven edges) and a textured felt finish similar to watercolor paper. These cards pair with envelopes that feature an old word flap design. Since these papers are all imported, the sizes are European. Which means the invitation and envelope are larger than standard US invitations. Postage costs a little bit more, however the impact is worth the investment. The most economical paper option we offer. While we try to offer options for every budget, we don’t believe in offering cheap materials. That’s why we source the thickest card stock that still works well for digital printing. Lux cotton paper is a classic. We use Crane Lettra as our letterpress paper of choice. It creates a deep impression with letterpress and comes in different weights. When you choose Lux Cotton paper, your invitation will be printed on 220 lb (double thick) paper and the other cards will be printed on 110 lb Lettra paper. Paper is available in the same colors as the 130 lb. card stock (shown). Handmade paper is truly a beauty with its imperfect texture and organic edges. Handmade paper can be difficult to come by, and may require additional production time as it is usually imported from Spain. It is available in a variety of envelopes colors, but the flat cards are usually ivory. We can discuss handmade paper options in your consultation and provide samples if available. 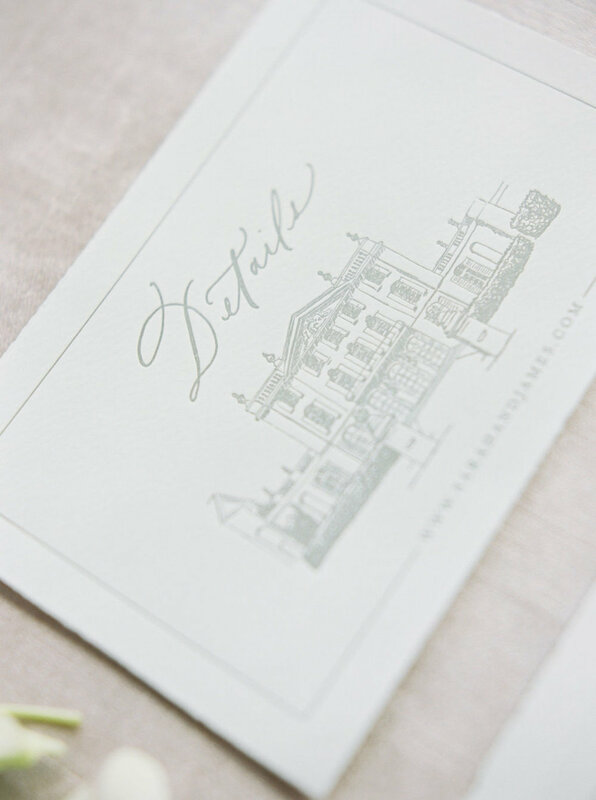 Set the tone for your stationery with our beautiful, hand-selected envelopes. Offered in five colors, select the envelope that fits your wedding’s aesthetic. *NOTE: Colors may appear different in real life. Images are film photography which often appear a bit lighter than in person. Colors may also vary from screen to screen. To see envelope and ink colors in person, please request a sample suite. 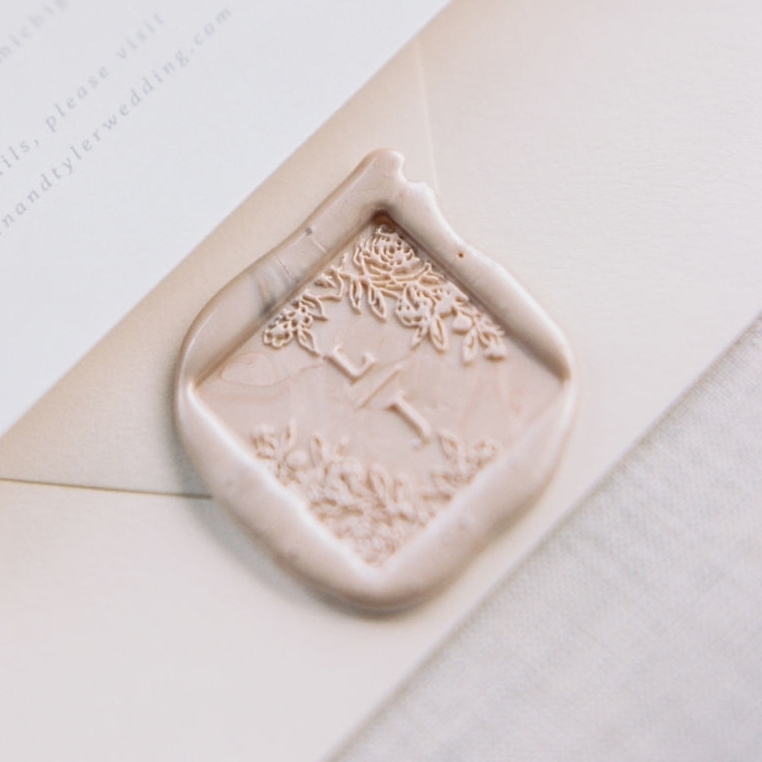 When it comes to invitation suites, wax seals are the cherry on top. We offer a selection of four (4) unique wax seal options to add on to your invitations. We work exclusively with Artisaire to source our stamps and sealing wax. Customize your seals with any of their wax seal colors. Our house ribbon colors are a timeless addition to any of our invitation suites. We’ve carefully selected naturally hand-dyed ribbons, in three of our most popular colors. Pair with a suite alone or secure it with a wax seal. Wedding stationery does not need to be stressful. We are here to help, every step of the way. As a full-service stationery boutique, we take your paper dreams from concept to completion. From addressing your envelopes to assembly and mailing, we are here to help shorten your wedding to-do list and provide you with a memorable planning experience.